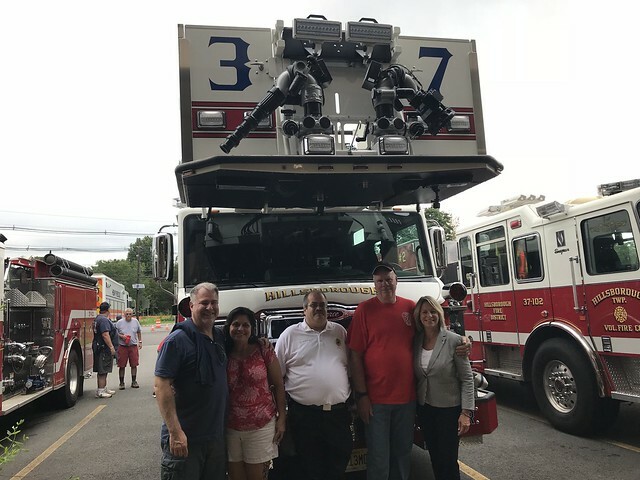 On Saturday, August 11th, Hillsborough Fire Company #2, Station 37, located on Route 206, held a truck dedication ceremony to officially announce their newest addition… a 2018 Pierce Velocity tower ladder truck. The new state of the art apparatus, which replaced an older piece of equipment, will provide firefighters with the latest in technology and safety. “Our firefighters who will be using this new equipment are very beneficial and valuable members of the Hillsborough area. These volunteer firefighters are more than just firefighters, they are heroes,” stated Mayor Gloria McCauley, who had the honor of participating in the ceremony. The Mayor also shared a quote from Bob Riley “Hard times don’t create heroes. It is during the hard times when the ‘hero’ within us is revealed”. Thank you to our Hillsborough Heroes for all that they do. and congratulations to Station 37 on their 70th anniversary this year!